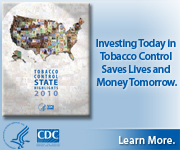 The HPRCD conducts research in health promotion and tobacco cessation, with a special focus on high-risk populations with tobacco dependence receiving care in community mental health centers and in primary health care settings. Our Center Co-Investigator, Mary F. Brunette, MD, developed a series of five short videos for clinicians about smoking cessation. “Smoking Cessation for Pregnancy and Beyond: A Virtual Clinic” is an updated online training, based on the "Virtual Practicum" model. The training is intended for health care professionals who will be assisting their female patients in quitting smoking, in particular, patients who are pregnant or in their child-bearing years. This training was developed by Interactive Media Laboratory, Dartmouth Medical School, in collaboration with the American College of Obstetricians and Gynecologists and was supported by the Centers for Disease Control and Prevention cooperative agreement 1U48DP001935-01.